Autoclavable and Reusable up to 5 Times. Made of Grey Silicone. Pierceable silicon rubber sealing mat for 96-well plates. Suitable for heat sealing. 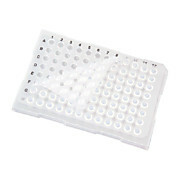 96 Well Silicone Sealing Mat for PCR Plates, Pierceable. 384 Well Xtreme Series Silicone Sealing Mat for PCR Plates, 10/pk, Pierceable.